Tired of searching the internet for worksheets which never quite fit? Frustrated that they can't be edited and they're branded with the website logos? With Teacher's Pet Tools you can quickly and easily make perfectly-suited worksheets which are fully-editable all from one compact toolbar in your word processor. 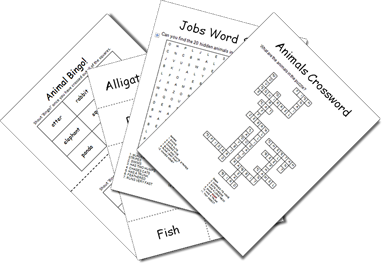 Developed by a teacher, it includes a crossword puzzle maker, bingo cards maker, jumble maker, word search puzzle maker, flashcard maker and much more. And, you can download the toolbar for free! Using the Teaching Resource search tool (right), you can easily find articles, poems, quotes and much more to work on with the Teacher's Pet toolbar. Give it a try! The Teacher's Pet can transform word lists into crosswords, word search puzzles, bingo cards, flashcards and more! Here are some word lists to start you off! Using Teacher's Pet Tools you can easily turn news articles into fun lessons for children!